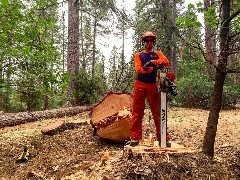 TreeSafe provides a variety of residential and commercial tree services to the Nevada and Placer county region. With a focus on large or hazardous tree removal and an emphasis on safety -- our team of tree professionals is equipped to tackle your tree care needs. We pride ourselves in utilizing the most up-to-date industry technology and following OSHA/ANSI standards. 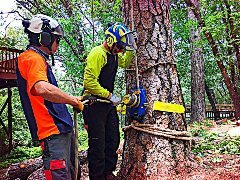 Established in 2009 as a first generation, family owned tree service, we strive to exceed your expectations by upholding a high standard of integrity. It is our goal to streamline the process from start to finish while providing clear and concise solutions to your tree concerns. We are state licensed, bonded and insured -- including general liability, automobile and workers compensation. SCL#954399. Click HERE for additional licensing and insurance information. Over the years, we have been fortunate to comprise a group of outstanding individuals who have been well-trained in their respective field. At the core of each team member is a true love for the tree care industry. Like a well-oiled machine, we come together to communicate efficiently and execute with precision. Comprised of an ISA Certified Arborist, a Certified Heavy Equipment Operator, technical climbers, fellers and rigging experts -- TreeSafe has you covered. When it comes to tree care, we like to stay in the know -- implementing the latest standards and tools to most efficiently get the job done. Our team enjoys attending local ISA climbing competitions, Arbor industry events, TCIA expositions and much more. It truly is a passion and lifestyle! Core team members maintain CPR certification and undergo annual safety training courses to further promote and practice quality control. Our mission is to operate with honesty and integrity, well exceeding customer expectations. We strive to leave a minimal foot-print and respect the surroundings of the job-site. Whether it be your home or landscaping, safe-guarding your property is our priority. TreeSafe aspires to provide you with excellent service at competitive pricing. When diagnosing tree foes, we believe it is crucial to convey upfront and honest recommendations to provide adequate solutions. It is our objective to deliver prompt service without sacrificing quality. Ultimately, tree preservation is the desired avenue when viable -- our goal is to provide you with solutions and options that are tailored to meet your needs and budget. Contact us today to learn more or to set up a free quote.